This story is a part of our Animal Welfare series highlighting yet another amazing fundraising story -- this time from The Ray Pack, a husky rescue. Their widespread fanbase and their efforts to save Dre, the husky with the heart condition, caught our attention and hearts! The Ray Pack is a husky rescue in a small town that achieved the impossible by raising $5000 in two days to save a husky through public appeals and creative hashtagging, videos, and photos on social media. It all started when The Ray Pack took in Dre, an 18-month-old husky, from an animal cruelty case. Until then Dre had been chained up and abused by his previous owner. Like any other foster case he was checked for heartworms and vaccines, until veterinarian noticed something unusual. A few tests and an ultrasound later Dre was diagnosed with Tetralogy of Fallot, a serious heart condition. Usually fatal before a dog reaches 6 months the veterinarian was surprised Dre had survived so long. Scouring the internet Rachel found the only veterinary cardiologist who had successfully performed the procedure on a dog. After scheduling an appointment The Ray Pack was left with a $5,000 bill and a week to come up with the money, they began to reach out. They started by telling Dre’s story. Riddled with detailed they explained the heart condition and surgery Dre would go through. The Ray Pack offered hospital reviews, links about the surgeon, and a breakdown of costs for their trip. Their complete transparency and daily updates kept fans connected. In just two days The Ray Pack reach their $5,000 goal from their friends and Facebook fans. The support flooded in from all over. Payments were made to the animal hospital, a dog friendly hotel was booked for the week, and a rental car was paid for. Rachel regularly posted photos or videos using #DreDay, and followed up with a quick update on how the pup was doing. She captured every moment from Dre getting in the car to settling in in at their hotel making fans felt like they were with them on the journey. During their trip the support continued. A company made "I Love Dre" T Shirts and a facebook fan made a surprise visit. Driving from Wyoming to Colorado the fan visited Dre in the hospital bringing him toys and covered the last $1,500 of hospital bills. Dre quickly recovered from surgery and a week later headed to his new adopted home. 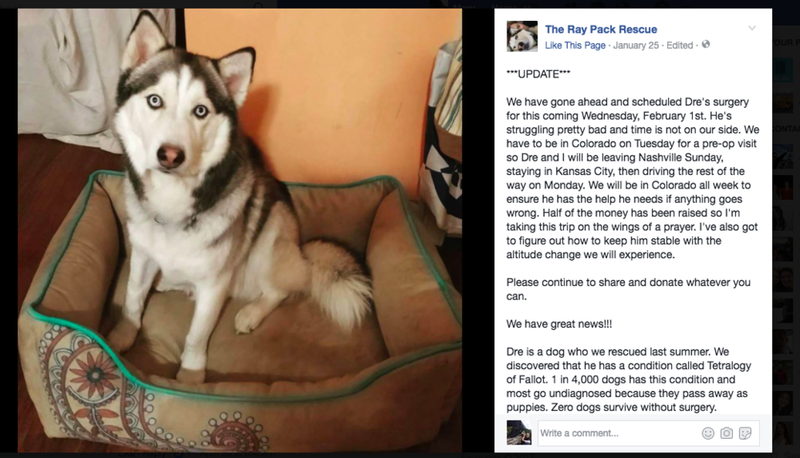 The Ray Pack Rescue still visists and updates their fans on Dre’s condition. Rescuing such a specific breed makes it challenging for The Ray Pack to have a strong local presence. We were so impressed by their dedication to the breed and the immense support system they've developed through social media.